42-year-old Utsumi Takayuki works for Second Division of Hinode Advertising�fs Planning and Sales Department. He was transferred from the General Affairs Department one year ago, but he keeps delivering the worst sales performance. Utsumi is not eloquent, poor at dealing with things and is a pushover too. He always gets reprimanded by his boss Dozono Shoko. His only pleasure is skipping work, going to the public bath in the day on a weekday and gulping a beer down his dry throat after that. Utsumi cannot resist the temptation when he sees a public bath during working hours despite his sense of guilt. On this day too, he calls his company with the excuse that he has urgent business and walks through the door of a public bath in high spirits. When he pays the fee, takes off his suit and enters the bath, the best moment awaits him. 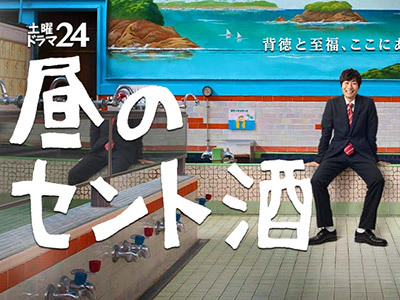 Ad man Utsumi-san is a fanatic for sento (sento are public baths with simple heated water - as distinct from onsen, which use natural hot spring water.) He's also a fanatic for beer. So he indulges in a bath-then-beer routine every single day, right in the middle of his work shift. As drama it's very thin and very repetitious. 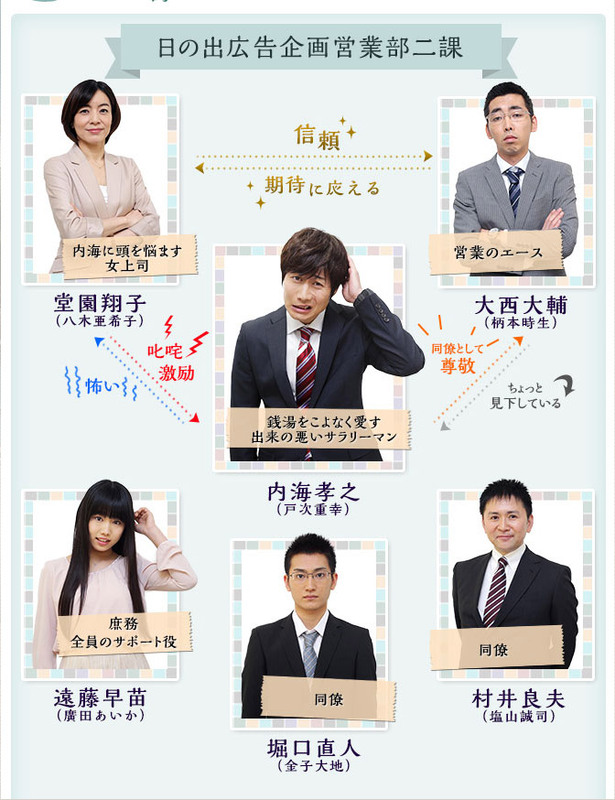 Other than incidental conversations with other bathers, the only dramatic content comes from Utsumi-san's interactions with his co-workers and boss, but those are momentary because these people spend most of their workdays doing cold-calls and, particularly in Utsumi's case, door-to-door solicitation. So there's just a little conversation, then he heads out on his rounds. Utsumi himself is not what you would call an admirable character either - he's awful at his job and always at dead-last in his sales quotas, adept only at rationalizing his daily bathing excursions. There's a plausibility problem in that it's difficult to believe his superiors would fail to find out what he's up to, much less that they would want to keep him around. At a number of points there were opportunities for the story to go in new, more interesting directions, but it never did. What if Utsumi channeled his love of bathing and his knowledge of sento culture into some lucrative ad contracts with sento and onsen owners, thereby pulling himself out of his slump and passing some of his co-workers? I'd expected that to happen, particularly when the pressure to improve is exerted upon him by his supervisor and co-workers alike. It would be a logical progression, but... no. In a later episode the ad company owner comes in to do a pep talk in which he exhorts the employees to work on their magnetism and personability, so as to be more upbeat and appealing to prospective customers. So I kept thinking "What if he bumped into Utsumi at a sento, but instead of chastising him, encourages him to cultivate this interest and parlay his sento contacts into a new clientele?" Nothing like that happened either, of course. Instead it's an identical formula, every episode. He goes out on his rounds; at some point he sees a sign indicating a sento bath; he wrestles with the propriety of playing hooky and ultimately rationalizes doing it; he calls the secretary girl at work with instructions to write "No Return" on the greaseboard that shows the employees' daily plans; he relishes the bath and each sento's unique features; he leaves refreshed and goes in search of a restaurant for snacks and beer; he chugs half a mug of beer, then the lights dim and he does an over-the-top monologue about it; his boss calls just as he's reaching his crescendo of revelry; he remembers "Oyeah, work" and heads back. So ordinarily I would give something this formulaic three or four stars, so why am I giving it six? The show has some redeeming qualities, chief among them is the fact that it's a good sampling of some classic sento baths (it's apparent that these are all actual places, rather than fictional establishments.) In that sense it reminds me of "The Guide: Five Stars in Kyoto," a drama that Crunchyroll had up until a year or so ago - though that one had far better drama, albeit in outright comedy form. It's a good travelogue for people interested in Japanese onsen and sento culture and who are planning a trip there. It also works as instruction on onsen/sento etiquette. There is also an excellent variety of characters that Utsumi-san encounters in his bathing, and I mean *characters. * While American television seems to funnel people into a narrow monotone of caustic, deadpan sarcasm and "attitude," here you have a multitude of characters as fascinating as they are strange, even though Utsumi's interactions with them tend to be brief and superficial. Finally, as a fan of both beer and hot springs, I have to allow personal bias to award this a point or two it wouldn't otherwise deserve. "Hiru Sentozake" is not a great story, but it's an excellent catalog of sento baths in different locales and of some interesting food. Beyond that there is something relaxing just in contemplating a day at a spa, something that makes this show more appealing in hindsight than it has any business being.